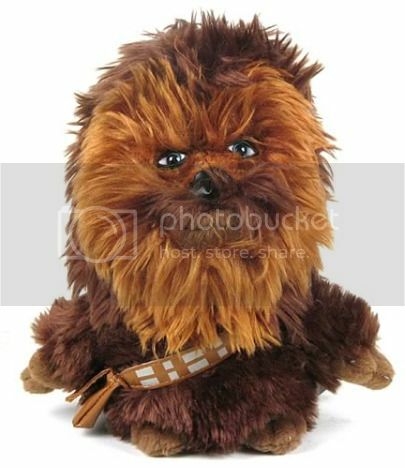 Thanks to this Deformed Chewbacca Plush, I discovered that there’s a whole series of “super deformed” plush dolls out there in the digital electronic commerce warehouse that is the internets, and wondered: who the hell would pay good money for a toy that looks like it came off the line before they were done calibrating the machines at the toy factory? And then the brilliance of these super-deformed plushes finally struck me: women find overtly-flawed things (e.g., some men, puppies) adorable. Which also happens to be the sole explanation for the career of Matthew McConaughey. This is true. I made my boyfriend buy all of them and I am a lady. I have Chewie on my desk at work. He is adorable. I find that absolutely adorable. More evidence to support your theory. They’re pretty cool looking. They remind me of bobble heads, but now you can sleep with one.